The biggest mistake we see is people buying a concealed carry firearm for its looks or "cool" factor. Forth capacity, the maximum capacity is not always the best option. There are many communities throughout the USA that regulate magizine capacity. Check with the manufacture to ensure your choice of firearm can comply in all the areas you travel. Fifth control. Proper control is best achieved when the firearm fits correctly in your hand. When we fit you with a firearm we look at your unique bone structure and match you with a compatible firearm. Sixth caliber. When selecting the caliber of your firearm a few things to consider are: recoil, cost and availability. Make sure you can handle the recoil of the caliber. Cost is important because you need to be able to afford to practice and practice often. Lastly, is it readily available? Within the realm of conceal carry a firearm gives the possessor a sense of security. This is why many carry a firearm and most likely why you are researching it yourself. Like many others, you desire the security and protection a firearm can bring to you or to you and your family. We at CTU take great pride in providing our students the knowledge, skills and abilities to appropriately respond in a crises situation. Your training will be the difference between murder and defense. Once you have obtained a clear understanding of the law with CTU's educational courses, we will take it to the next level. We will apply the law in your unique CTU Scenario Training to ensure you not only survive the threat but you are justified by the court. At CTU we "train like you own it!" "Proof that Concealed Carry permit holders live in a dream world"
America is a land of freedom, freedom of religion, speech and the pursuit of happiness. In America we possess the freedom to live up to our potential. We are free to become doctors, lawyers, construction or factory workers. Our opportunities are endless. However, many of these opportunities require extensive education and/or training. When we go to the doctor we expect that doctor to be well disciplined in medicine. 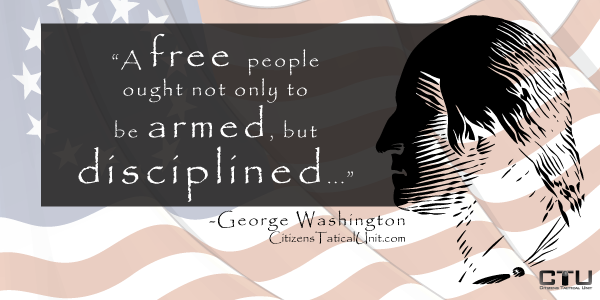 When you purchase a firearm you are expected to be well disciplined in firearms. Upon exercising our 2nd Amendment right we inherit the responsibility to acquire the skills, aptitude and confidence to carry and utilize that firearm in a defensive and safe manner. Obtaining a CCW is NOT enough. You must train properly. Protecting yourself and your loved ones with a firearm is a discipline you will master with CTU. Train like you own it is our catch phrase. It simply means we never stop learning and training. We want to be comfortable and familiar with your firearm, it needs become an extension of you. CTU training has the ability to bring you to a level of confidence in safety, security and accuracy so that you will be able to defend yourself from the threat and be justified by the court.